The building is possibly 18th century or early 19th century in origins but has been altered and extended. Of three storeys with a parapetted front. The roof in 1962 comprised two hipped ranges. Alterations to the building were approved in 1921. Changed name to the "Flying Dutchman," as yet date unknown. From the Maidstone Gazette and West Kent Courier, 12 April, 1831. A Free Public House, known by the "Ordnance Arms," situate at Queenborough, in the Isle of Sheppey, and well adapted both as to convenience and situation for trade. Good bedrooms, cellarage, stable, chaise house, and outbuilding. To be taken by appraisement. N. B. For particulars, apply to Mr. John Hall, proprietor; or to Mr. J. Atwater, Auctioneer, Sheerness. If by letter post-paid. Canterbury Journal, Kentish Times and Farmers' Gazette 07 March 1903. The renewal of the licences of the "Highlanders," Minster; the "Ordnance Arms," Queenborough; the "Angel," Rainham; the "Chalk Tavern," Milton; and "Rainham Mark" beerhouse were opposed by the police. 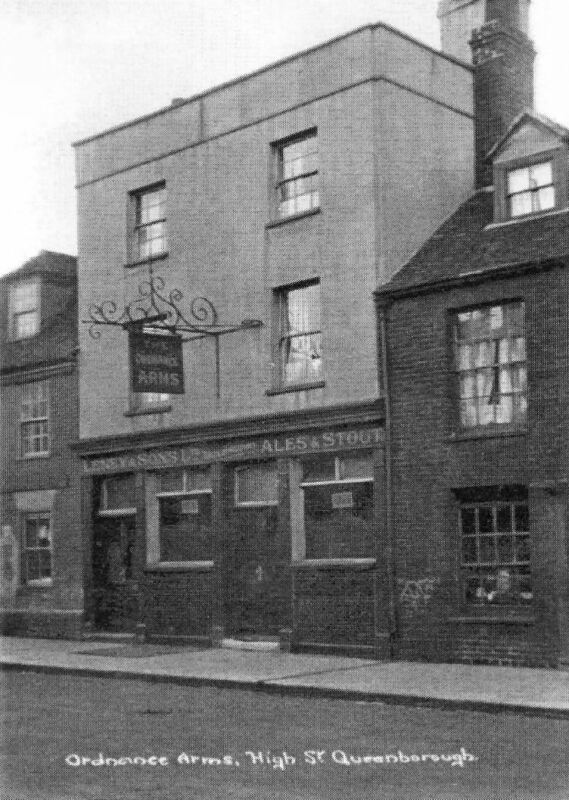 The Bench refused the renewal of the licences of the "Highlanders," the "Ordnance Arms," and the "Rainham Mark," but granted renewals to the "Chalk Tavern" and the "Angel Inn."